So a 1.5x leveraged 60/40 balanced fund? Yeah, no thanks. Interesting. It's good that they used futures instead of swaps, because swaps typically represent a hidden fee. Treasury futures are potentially advantageous compared to direct ownership of treasuries from a tax point of view, due the 60/40 long/short term capital gains treatment. I wonder how this ETF will handle distributions. I won't worry about it too long, since I would probably buy and roll the treasury futures myself if I wanted this kind of leverage. Combined with a leveraged small cap etf and leveraged EAFE etf, this could be an interesting portfolio component for a young investor with high risk tolerance and a small asset base. One of the key points of leveraged funds is that the buyer is expected to be smart enough to sell before it crashes (x 1.5)? I love seeing a five day chart with the customary disclaimer that "results are not indicative of future performance." Five days isn't indicative of future performance? Good to know. I certainly can't quarrel with that. I seriously don't understand what this fund actually does... but then since I'm not going to invest in it I don't need to. They talk about 1.5x "Accounting leverage" while stating that "This strategy does not borrow to enhance investment returns." Yet, although it says it "does not borrow," it also refers to "10% in cash posted as collateral for 60% notional exposure to U.S. Treasury futures." I don't understand why they need to post a cash collateral if they are not borrowing anything. The idea that you can get the benefits of 1.5X leverage without incurring the risks of 1.5X leverage seems unlikely to me. Oh, I also don't understand why The Case for 90/60 U.S. Balanced Fund (NTSX) presents the case for a "90/60" fund... which may or may not be investing 90% in stocks and 10% in something-I-don't-understand-that-works-like-50% bonds... by showing charts for "50% Equity/30% Bond/20% (Long/Short Equity)." I've been adding and subtracting various combinations of 50, 30, 20 and 20, like one of those pouring problems, I keep pouring back and forth trying to get 90 in one jug and 60 in the other... should the 20% long-short equity count as 0, as 20, or as 40? but I can't seem to get it to come out. Last edited by nisiprius on Wed Aug 08, 2018 7:11 pm, edited 1 time in total. I'm not sure that's a key point of leveraged funds any more than its a key point of any other fund. Ideally we'd sell ANY asset right before it crashes, right? When I clicked on that link, this is what I saw. How about you? Reproduced with both Safari 11.1.2 (13605.3.8) and Firefox 61.0.1 (64-bit), Mac OS X 10.13.6. Last edited by nisiprius on Wed Aug 08, 2018 7:12 pm, edited 1 time in total. Although it says it does not borrow, it also says "10% in cash posted as collateral for 60% notional exposure to U.S. Treasury futures." I don't understand why they need to post a cash collateral if they are not borrowing anything. I don't mean this as a swipe, but I think the issue is you don't understand futures. They talk about 1.5x "Accounting leverage" while stating that "This strategy does not borrow to enhance investment returns." I suspect they are highlighting the difference between buying securities on margin (which DOES involve borrowing) and buying futures contracts (which typically requires collateral). It sounds like they are only leveraging the treasuries 4x, so they'd probably never need to post more collateral even in an extreme crisis. But that is a theoretical possibility. I'm curious what you expected to see given that the fund has been in existence for 5 days, and is a generic growth of 10K chart that all fund pages include. Also, that sounds like boilerplate language the SEC makes them display. Not much to see here. A typical 2X or 3X fund doesn't actually return that because it's reset everyday. Will this 90/60 (is that 1.5X then?) work in the same way, or can one expect to actually see the results of a 60/40 portfolio (for better or worse) just with 1.5X as much money? If I buy and hold this guy, do I only need 17x my expenses saved up for the 4% withdrawal rate then? This is weird. I thought maybe the prospectus would help me. Their web page appears to have a bug, inserting a spurious and redundant port access for 443 (secure HTTP) into the middle of the URL. Sloppy! You are correct. I think this is a relatively sophisticated financial product. And this one looks like the prospectus, right? I haven't read all their material yet, but from what I can tell so far the treasury leverage in this fund does NOT reset daily in the same way that existing leveraged ETFs do. In principle, that means you could reasonably expect something close to 1.5x the return (and volatility ) of a 60/40 portfolio. Could I just go 100% stock and get the same bump in return on a 60/40 portfolio with a similar bump in volatility? Not sure what a 90/60 brings to the table that a 100/0 does not. Except one is way more complex than the other and that makes my head hurt. Sure, it does seem to be titled that way in the top-right. Someone mucked up a link. The .NET framework API call threw an exception, as it should. It's only dangerous for the server, not you. The problem is that ":443" is in the wrong spot. My bet is they converted the link from http:// to https:// using a script and it didn't handle the conversion correctly. I found it: Prospectus & Regulatory Reports | WisdomTree. Wait for the window to load and scroll to the very bottom. "You shouldn't buy anything too complex to explain to the average 12-year old." Last edited by Taylor Larimore on Wed Aug 08, 2018 7:35 pm, edited 1 time in total. Information Technology Sector Risk. The Fund currently invests a significant portion of its assets in the information technology sector, and therefore the Fund’s performance could be negatively impacted by events affecting this sector. Was that obvious from the web page blurb? All the blurb stuff seemed to suggest that this "90/60" fund should be thought of as a way to "Gain enhanced exposure to traditional 60% equity / 40% bond portfolios" and that it follows a strategy that's expected to "remain highly correlated to common portfolio benchmarks." Non-Diversification Risk. The Fund is considered to be non-diversified. Don't know if that's the sector risk showing up another form, or what. Again, that's quite different from "traditional" 60/40 portfolios. Since the Fund’s investment objective has been adopted as a non-fundamental investment policy, the Fund’s investment objective may be changed without a vote of shareholders upon 60 days’ written notice to shareholders. I won't fuss too much about all the places where it says "the fund does not intend to do this, but might." Can someone who does understand futures tell me something about this? To me it sounds like they are probably doing the normal, conservative, prudent thing, right? With respect to certain kinds of derivative transactions that involve obligations to make future payments to third parties, including, but not limited to, futures contracts, forward contracts, swap contracts, the purchase of securities on a when-issued or delayed delivery basis, or reverse repurchase agreements, under applicable federal securities laws, rules, and interpretations thereof, the Fund must “set aside” (referred to sometimes as “asset segregation”) liquid assets, or engage in other measures to “cover” open positions with respect to such transactions in a manner consistent with the 1940 Act, specifically sections 8 and 18 thereunder. In complying with such requirements, the Fund will include assets of any wholly-owned subsidiary in which the Fund invests on an aggregate basis. For example, with respect to forward contracts and futures contracts that are not contractually required to “cash-settle,” the Fund must cover its open positions by having available liquid assets equal to the contracts’ full notional value. The Fund treats deliverable forward contracts for currencies that are liquid as the equivalent of “cash-settled” contracts. As such, the Fund may have available liquid assets in an amount equal to the Fund’s daily marked-to-market (net) obligation (i.e., the Fund’s daily net liability, if any) rather than the full notional amount under such deliverable forward contracts. Similarly, with respect to futures contracts that are contractually required to “cash-settle,” including U.S. Treasury futures contracts in which the Fund invests, the Fund may have available liquid assets in an amount equal to the Fund’s daily marked-to-market (net) obligation rather than the notional value. The Fund reserves the right to modify these policies in the future. Last edited by nisiprius on Wed Aug 08, 2018 7:45 pm, edited 2 times in total. It's a little more complex than a typical 60/40 portfolio, but not nearly as complex as many funds that people happily own. Historically since 1930, a portfolio like this would have theoretically had returns about 24% higher than a 100/0 portfolio with 8% less annual volatility. So I think it is interesting in principle. Most of the 12 year old kids I know could probably understand this fund more quickly than most 82 year old investors I've met. I saw that too; I think you've noticed an example of Ctrl-X Ctrl-V Risk. I mean they used another fund's prospectus as the basis for this one. The relevant additional risks over a 60/40 portfolio appear to be "Market Risk", "Derivatives Risk", "Futures Contracts Risk", "Leveraging Risk", and "Models and Data Risk". The prospectus appears to be rather shoddily written. Careful tugging on superman's cape. Many common funds, maybe even some you own, are classified as "nondiversified". Vanguard runs dozens, I think, including all their equity sector index funds, virtually all tax-exempt bond funds, all their LifeStrategy and Target Date funds, and most of their 529 portfolios. Aargh. I computed it in Excel but I’m not at my computer now. I’ll try to add supporting details later tonight or tomorrow. So, you think the sector concentration in information technology, and the fund being officially "non-diversified" might be gross goofs in the prospectus? You think it really is a reasonably straight 60/40, times 1.5, where the 1.5X is achieved by financial engineering magic? The 90% stocks is really a plain old 90% allocation to stocks. The "60% bonds" is created by investing 10% of the fund in futures... and for some reason you can buy futures contracts on 60% bonds by putting up only 10%? I'm guessing that the reason you can do this is that the behavior of bonds is so tame and predictable that both parties agree that there are not likely to be big surprises, and the little surprises can be covered by that 10%? So as long as everything goes smoothly with the futures, you are getting the equivalent of 1.5X (60/40). What happens if there's a glitch, hiccup, nobody-could-possibly-have-foreseen event in the bond market? I guess that's what the "futures risk" is about. Last edited by nisiprius on Wed Aug 08, 2018 8:17 pm, edited 2 times in total. I don't see the mystery. Here's my hack explanation for what the fund is doing. It would be better if I were twelve. It owns 90% large cap stocks. It has 10% invested in cash. It has 60% notional exposure in a mix of 2, 5, 10, and 30-year Treasury futures contracts. This is the source of the leverage, and I think this is the part that is confusing people. But notional exposure is just a fancy way to say the exposure you bought with the futures contracts. The cash is acting as collateral for the futures. So, you think the sector concentration in information technology, and the fund being officially "non-diversified" are mistakes in the prospectus? I suspect it is the treasury futures that make it nondiversified, since you don’t need very many to create the target duration exposure. But if the equity portion is being invested in a S&P 500 index fund instead of being separately managed, that make it nondiversified also. You think it really is a reasonably straight 60/40, times 1.5, where the 1.5X is achieved by financial engineering magic? The 90% stocks is really a plain old 90% allocation to stocks. The "60% bonds" is created by investing 10% of the fund in futures... and for some reason you can buy futures contracts on 60% bonds by putting up only 10%. I'm guessing that the reason you can do this is that the behavior of bonds is so tame and predictable that both parties agree that there are not likely to be big surprises, and the little surprises can be covered by that 10%? I do think it is a goof, but the nondiversified might be a legitimate risk because of how they get the exposures. It appears to be a reasonable straight 60/40 time 1.5 fund. I don't know though, but it doesn't matter to me personally because I will not be using it. I'm not familiar with how futures work so I won't comment on that out of fear of saying something wrong. I don't currently understand it so I won't invest in it, but others might. As they say in Wikipedia, "citation needed." The sector index funds, well, of course. Their whole point is not to be diversified. And as expected, the prospectus for one of them contains the language "Each Fund is considered nondiversified under the Investment Company Act of 1940." But please tell me the page number on the LifeStrategy funds prospectus where it says that, or anything like that. Because I can't find it. And please tell me the page number on the Vanguard Target Retirement Funds prospectus where it says that, or anything like that. Because I can't find it there, either. The S&P500 is an index of large market cap companies traded on US exchanges, not of companies headquartered in the US. You can see the list of companies on wikipedia and see where that country breakdown comes from. Caution, Wikipedia is not an authoritative source. Let's go directly to the authoritative source: S&P 500® - S&P Dow Jones Indices and download the factsheet. There are 505 companies in the S&P 500, and they are all based in the US. So I've never been very good with derivatives. This fund is using futures contracts in order to try to beat the market return. If it works, and the fund "wins" by beating the market return, who is the party that "loses"? I'm guessing the counterparties on the other side of the futures contracts. Yes? No? Not even wrong? And here I thought I was overweight in Peru. Incorrect. You have to read the footnotes which refer to companies which are US domiciled, which ultimately becomes a question of index methodology. Just as an example, for Ireland, the Vanguard S&P500 Index Fund Annual Report lists holdings in Accenture plc Class A shares in the amount of 10.6 million shares. Accenture is based in Dublin, Ireland. The answer lies in the Eligibility criteria for Domicile from the S&P U.S. Indices Methodology. plurality when there is incomplete asset information. of convenience” (see Appendix A). Indices normally determines that the company is still a U.S. company. officers, directors and employees, investor perception and other factors deemed to be relevant. So, like ADRs are not eligible but plenty of other companies are. This is all just to answer columbia's question -- I don't actually think these companies are truly and properly not US companies. But, he asked why the country breakdown was why it was. The answer is because not every fund company recognizes the S&P's committee's somewhat arbitrary inclusion rules. Other index companies will have other rules, so what are you going to do when writing a website or assigning a stock to a particular country? Morningstar has a similar difficulty. I also don't see a problem with my citing Wikipedia here. 1) do Treasury futures behave differently in a rising rate environment. Does the same basic rule of holding for the duration to recover from NAV loss hold true. 2) How much will this affect rebalancing? The fund is going to maintain 90-60 exposure (and rebalance when %5 off). I'd guess that rising rates would lower bond NAV, and perhaps the fund would move some stocks to cash so it could gain more Treasury exposure. Conversely, if stocks crashed, the higher treasury exposure would allow one to rebalance more into equities. I don't understand futures though, so this might just be silly conjecture. I mean can we predict how this might behave over different environments? The wisdom case for .pdf notes in a rising rate environment, this could be beneficial tax wise as capital gains on Treasury futures contracts are taxed at 60% long-term, 40% short-term capital gains rates instead of distributing interest that is taxed at marginal rates. gains" ... so that seems like a little more complicated that just holding a vanilla ETF. Of is that handled by the fund? Last edited by typical.investor on Wed Aug 08, 2018 9:02 pm, edited 1 time in total. As they say in Wikipedia, "citation needed." I was definitely mistaken. I could swear that the SEC considered all fund-of-funds to be non diversified, but I must have either been plain wrong or there was a regulatory change that I missed. I don't suppose you can do rolling 10 or 20 year terms. I don't find it shocking that the fund does well over a 90 year period. That is sort of what you expect. The question to me is what the couple of poor performing segments look like. You would probably need some period where both stock and bonds dropped to have higher than 100% stock volatility. Here's a link to a backtest in PortfolioVisualizer (with the caveat the quick 1.5x simulation I made may or may not match what this new ETF actually produces. NOTE: I did NOT simulate expenses, though at 20bps I don't think that matters an awful lot. 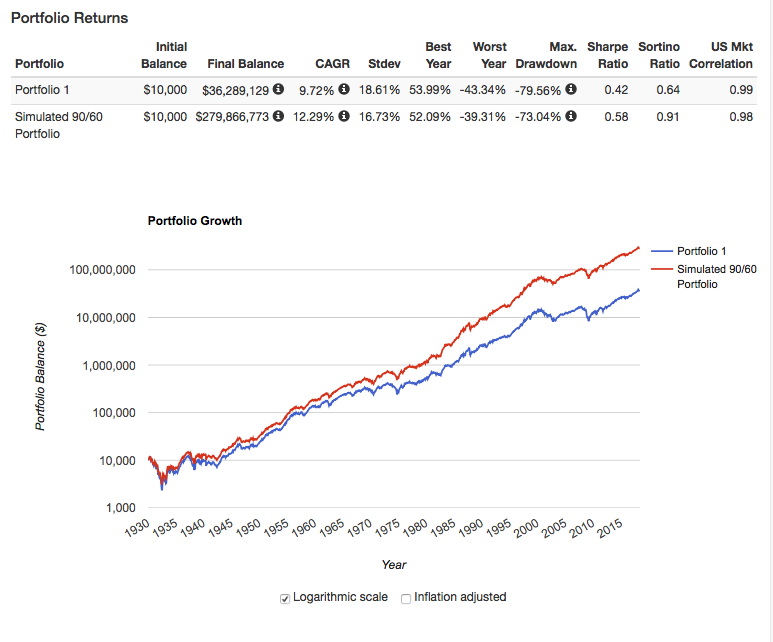 Portfolio 1 is 100% large cap stocks (the SBBI total return series). Interestingly, the drawdowns for the 90/60 portfolio were slightly smaller than those for the 100/0 portfolio but it remains to be seen how well the futures contracts perform for this fund is a truly stressful market. Last edited by vineviz on Wed Aug 08, 2018 9:26 pm, edited 1 time in total. This is IMO a really solid approach to take and is not excessively risky, given treasury collateral that's about 5x higher than is typically required for a futures contract. PIMCO has done this for years with their witch's brew of bonds and their Stocks Plus Funds, though they've gone with futures/swaps on the equity side rather than the bond side. Doing this on the bond side and with futures rather than swaps is very conservative and avoids most counterparty risk. Treasury futures are hyper-liquid and you can achieve a return profile nearly identical to holding the underlying bond. Rather than a 90/60, I'd say you're getting more like a 90/50/10 Stocks/Short-Intermediate Bonds/T-Bills portfolio, which is pretty respectable for a young accumulator. Regarding the information tech concentration risk, the S&P 500 is at nearly a 25% sector concentration. Lots of value funds have similar warnings about financial sector concentration. The devil will be in the details, but I could see this being a major (positive) trendsetter. Also, this would be a much safer portfolio than the infamous "mortgage your retirement" thread, as the leverage is constant and on the less volatile bond side, not the stock side. So is this a mild form of risk-parity trading or a different beast entirely?